Blind Dead McJones was never a fan of being in the spotlight, no number 1 singles, cheesy videos or appearances on celebrity cooking programmes. A true Bluesman in every sense of the word, living a life on the road shrouded in mystery. Some say he died years ago in an agriculture related accident, some say he is part of the keyzer soze family and some say he now makes Halloween costumes for dogs. One thing we know for sure is he is responsible for bringing together the blues rock behemoth that is The Blind Dead McJones Band. Back in 2008 McJones was a lost and tortured soul, wandering the earth just like Kane in Kung Fu. Battling with his demons and struggling to keep going through the Hell that is the music business. All he needed was a friendly face, a pack of smokes and something to help him once again shake the earth to its very core, bring grown men to tears, turn sophisticated women once again into sreaming schoolgirls, and well and truly cement his place alongside the Gods. “The Boys” are three of the finest young musicians in their price range. Nobody knows exactly why McJones decided to switch from working with battle hardened top of the line professional musicians to these three. Maybe it was their youthful enthusiasm, their quirky sense of humour, their undying love of the music and performing, the raw magnetism of Ben’s beard, most likely he was just a bit strapped for cash. Whatever his reasons were he took the boy’s under his wing like a goddamn chicken and educated them in his ways, raised them as his own and turned them into the best backing band he could afford. 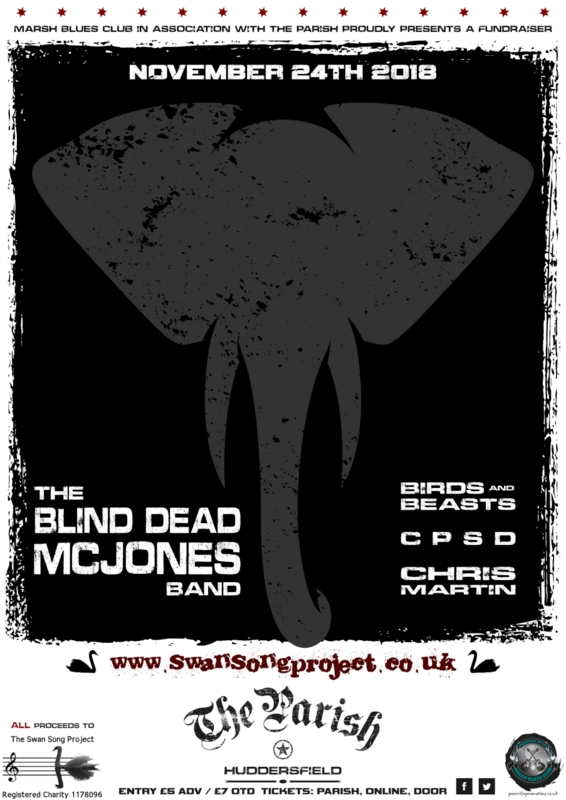 The debut performance of The Blind Dead McJones Band came around and you’d never guess what happened! The great Blind Dead McJones failed to show! This left the Boy’s in what could be classed as a “tricky situation”, what’s a backing band to do with no one to back? The Boy’s decided to simply play and have some fun. Guitarist Ben “Buddy” Slack donned his best McJones vocal impression and they winged a performance to a mediocre reaction from a confused crowd. This is how our tale has continued over the years with McJones absence being one of the most consistent elements of The Blind Dead McJones Band. The Boy’s have embraced this with open arms and relished the opportunity to develop themselves as a 3 piece band. They’ve taken the great blues lessons learnt from McJones and infusing them with their other influences and quirky sense of humour to create their own original sound. McJones seems happy with the arrangement as well, acting as a silent partner in the bands development. Advising the boys on all things blues and still making the occasional cameo appearance. A natural instinct for pop music; a classic and distinctive sound. Stories from the animal kingdom make for songs that get under your skin. The relentless march of nature, the vicious circle of life, the raw, wild call to summon forth from your loins the next generation. These are the things that inspire Birds and Beasts and once your ears taste their music, you too will be marking your territory, howling at the moon and putting on a display for your mate! Chris (The man in a hat) Martin is something of an enigma, having been found in a hand bag on Batley rail way station many years ago. He was educated by the finest minds in Europe and can speak fluently in 32 languages and dialects, holds degrees in both metaphysical theology and drawing with big crayons. Musically he is a blues shouter and guitarist, playing slide and finger style and also lap style. Throughout a long and varied musical career, spanning well in excess of a year and a half he has both thrilled and puzzled audiences the world over (well round Yorkshire ). He may well talk more than he plays, but whatever happens someone should have a good time. If there’s nowt on’t telly and it’s not raining go and see him, at least you’ll get a free Jaffa cake. C.P.S.D is a Bradford based heavy blues trio mixing hip hop influences with Big guitar riffs and desert influenced vocals. Tickets £5 advance / £7 on the door.